Siri – The Voice with a Smile? Welcome home Mac! The first Mac Pro to be Made in America will be unleashed in December. This news got us to thinking about all things Mac and we zoomed in on Siri because the real voice of Siri was recently uncovered. Exactly two years after Siri made her auspicious debut on October 4, 2011, the mystery woman’s identity can now be revealed. Apple’s voice activated virtual assistant never quite took off in popularity the way Apple envisioned her, but the closely guarded identity of the oft time snarky Siri has been widely speculated. According to CNN, she is an Atlanta based voice over actress named Susan Bennett. Though Apple is being cagey and won’t confirm it, the sleuths at CNN found audio forensic experts to back up the actresses claim. Would You Repeat That Again? Staying connected with the assistance of a disconnected female voice is nothing new. 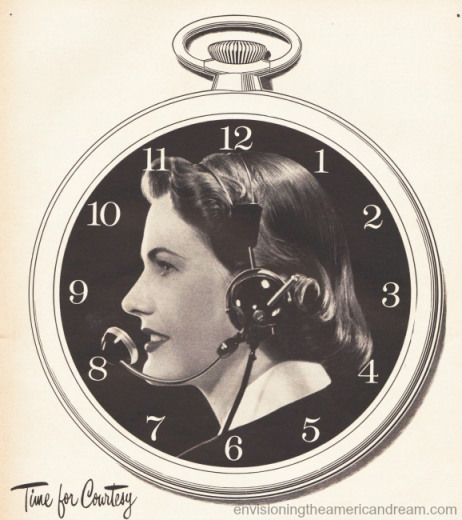 “The voice with a smile” was the familiar AT&T slogan used from the 1930’s through the 1950’s . 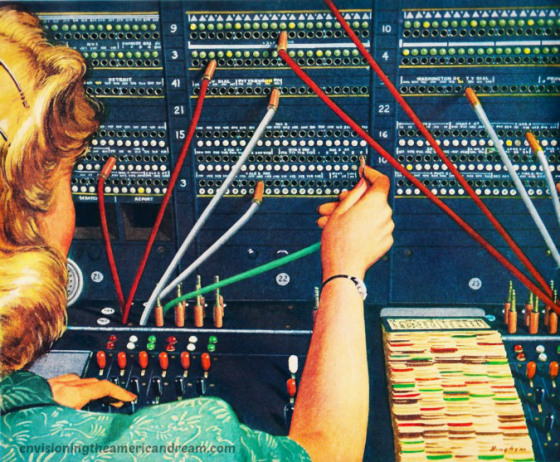 The ads visualized the cheerful sound of the company’s female operators painting a pretty face on the happy voice of the phone worker. The speech of operators was firmly regulated through strict codes of appropriate responses enforced by supervisors listening unannounced on operators line. “Operator ~ May I Help You? 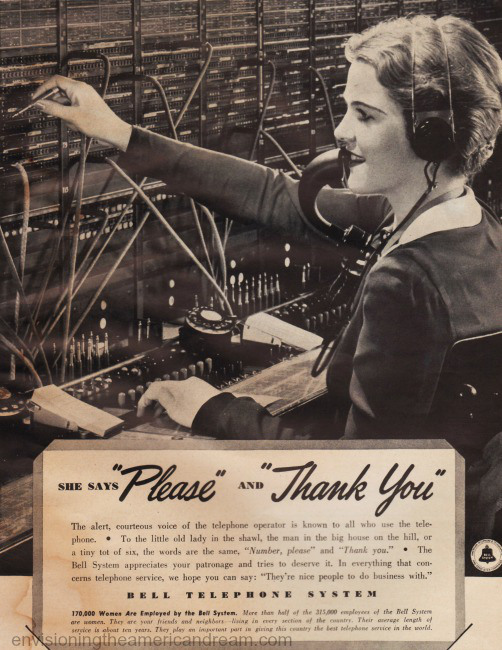 "The Bell system appreciates your patronage, and tries to deserve it"
From the beginning, the occupation of switchboard operators was almost exclusively female. Women were valued not only because of their gentle voice, and nimble fingers , but as an added bonus, they worked for lower wages. What Number Did You Want? 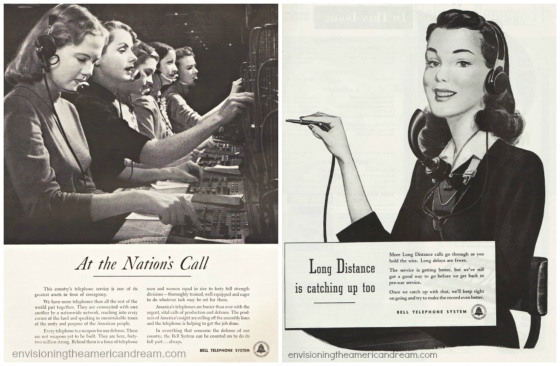 From the 1930’s through the 1950’s AT&T recruited female employees through popular women’s magazines such as American Girl, Senior Prom and True Story, appearing next to ads for weight loss, feminine itch relief and bust creams. Perhaps courtesy and manners have gone the way of the telephone, which itself is beginning to feel rather antiquated. 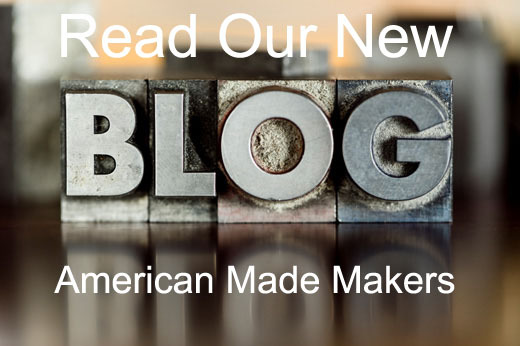 This entry was posted in American Way, Humor, Nostalgia, Uncategorized and tagged Apple, Heritage, Humor, Our Country, Our People, Our USA, Siri, The American Dream, Vintage by Sally Edelstein. Bookmark the permalink. Sally Edelstein is an award-winning artist and writer whose work has focused on mid-century American culture. Her nationally exhibited collages of vintage imagery, (www.sallyedelsteincollage.com) offer a remix of popular culture. Her blog, EnvisioningTheAmericanDream.wordpress.com, offers up a curated collection of vintage advertising and illustrations of mid-century American consumer culture. Weaving personal stories along with vintage images, the commentaries are an amalgam of satire, history and memoir.